Warren Buffett's, George Soros', and Carl Icahn's biggest recent buys include American Airlines, Williams Companies, and Herbalife. Warren Buffett, George Soros, and Carl Icahn are among the most successful investors of all time, so following in their footsteps could prove profit-friendly. Fortunately, these gurus file 13F reports with the Securities and Exchange Commission every quarter that show exactly what they've been stashing away in their portfolios. Since 13F reports can be a treasure trove of new investment ideas, let's take a closer look at their most recent disclosures and see what these billionaire money managers have been buying lately. Someone over at Berkshire Hathaway's Omaha headquarters made an industrywide bet on airlines last quarter, and while the buy may not have been made by Warren Buffett himself, it's still striking news given that Buffett has in the past panned the industry as a terrible investment. Last quarter, the 21.8-million-share purchase of American Airlines (NASDAQ:AAL) was Berkshire's biggest new buy. That stake is worth more than $1 billion today, and while that's a small slice of Berkshire's $130 billion portfolio, it still suggests Berkshire's money managers are confident that airlines are finally on solid financial footing. In the past, price wars and cyclical spikes in jet fuel prices have caused air carriers to struggle. However, the industry has done a far better job at holding the line on prices and managing jet fuel costs lately. Airlines, including American Airlines, have rightsized their flight schedules so that their planes are fuller, and they've embraced fuel-saving measures, such as baggage fees. They've invested in next-generation planes that are lighter and more fuel-efficient, too. 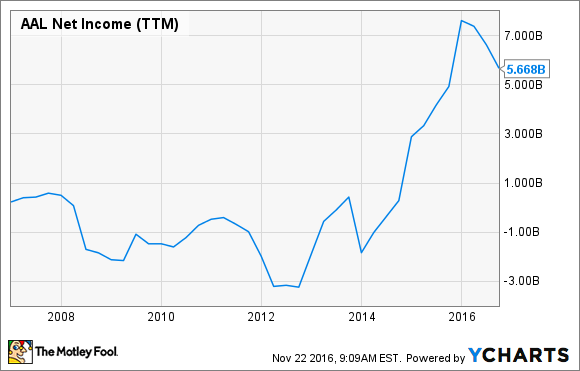 As a result, American Airlines (and its peers) are much more profitable than they were a decade ago. AAL Net Income (TTM) data by YCharts. Berkshire's managers appear to believe that this profit-first mentality will continue to pay off, especially if jet fuel prices remain in check. Jet fuel accounts for over 20% of an airline's operating costs, and lower jet fuel prices this year are providing a $21 billion tailwind for the industry globally, according to the International Air Transport Association. That's good news for airlines, and perhaps a big reason why Berkshire has become fond of them. 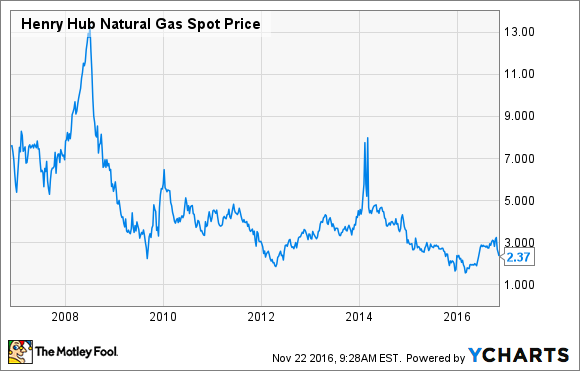 Historically, heating demand has made winter a good time to own energy stocks, and it seems that George Soros thinks that trend could boost the fortunes for natural gas pipeline operator Williams Companies (NYSE:WMB). Soros bought 3.1 million shares in Williams Companies last quarter to gain exposure to pipeline capacity serving some of the most prolific natural gas regions in the country. Williams Companies' Transco pipeline, for example, runs up and down the East Coast, from South Texas to New York City, transporting natural gas from the Gulf Coast, mid-continent, and Appalachia to Southeastern, mid-Atlantic, and Northeastern states. Transco is major source of natural gas to the Northeast, so Williams Companies could benefit if cold-weather-related demand boosts natural gas prices and volume. In the long term, Williams Companies could deliver growth to investors if its decision to cut its dividend to accelerate its expansion plans pays off. The company's slate of pipeline projects includes Atlantic Sunrise, a project that could increase natural gas takeaway in Pennsylvania's highly productive Marcellus shale. When it's complete, Atlantic Sunrise will add 1.7 billion cubic feet per day of capacity to the region. Currently, the Atlantic Sunrise project is being delayed by regulators seeking more input from residents. However, hurdles could become more easily overcome now that Donald Trump is heading to the White House. On the campaign trail, Trump proposed reducing regulation and increasing energy infrastructure and energy production. If he follows through on those plans, the benefit for Williams Companies would be significant. Admittedly, George Soros doesn't typically hold on to his stocks for very long, so Williams Companies could disappear from his portfolio as quickly as it appeared. Nevertheless, investors might not want to ignore Williams Companies, because if demand for natural gas increases and it can execute on its expansion plans, it may be able to restart its dividend more quickly than hoped. Image source: Carl Icahn via Twitter. Carl Icahn is famous for taking big and concentrated positions in stocks so that he can lobby for shareholder-friendly actions, such as dividend payouts and divestitures. In the case of Carl Icahn's big investment in Herbalife (NYSE:HLF), his interest may be more catalyst-driven. Herbalife has long been in the crosshair of hedge fund money manager Bill Ackman, who is short the company and has been a big critic of Herbalife's business model. Ackman has painted a picture of Herbalife as a Ponzi scheme that's reliant on securing new people to distribute its nutritional products, rather than retail sales. Ackman's ongoing criticism eventually led to a Federal Trade Commission (FTC) investigation of Herbalife, and the potential to settle that investigation may have been why Icahn established a massive 18% stake in the company. In July, Herbalife agreed to a $200 million settlement that includes a restructuring of its business. After Herbalife settled with the FTC, rumors emerged that Icahn might be interested in selling his Herbalife shares. However, rather than selling, Icahn bought even more shares. Icahn reports owning 19.6 million shares in Herbalife as of Sept. 30, up 15.36% from the end of June. It's anyone's guess how long Icahn will remain a Herbalife investor, but he hasn't shown much interest (yet) in selling, and Ackman continues to be short. Perhaps Icahn hopes Ackman and other short-sellers will cover their positions, sending shares even higher. If so, then this story's end may be determined by who blinks first. If Icahn sells his stake, shares could drop. But if Ackman covers his short first, shares could pop. That dynamic makes Herbalife a bit of a binary investment, so investors ought to approach it cautiously.